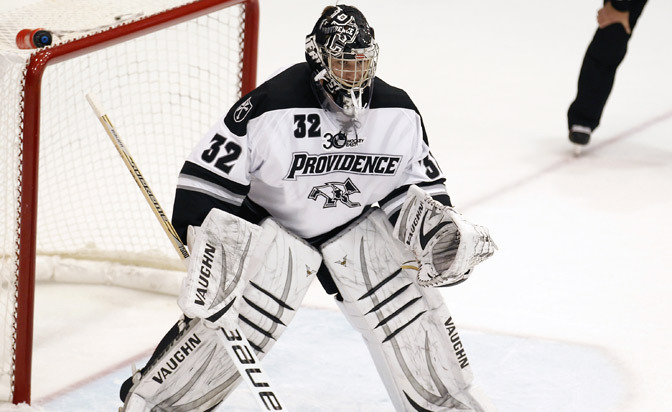 Providence College goalie Jon Gillies is a huge fan of Johnny Manziel. Not so much because the Texas A&M quarterback seems to dominate the college football headlines on a regular basis, but because he marches to the beat of his own drum. "He's a one-man show; things that go on in his life off the field don't affect him on the field and I respect that," Gillies said. "He just exudes confidence. From what I've read he seems to be an amazing guy." The 6-foot-5, 215-pound Gillies also is a pretty amazing guy. Not to mention a one-man show on occasion for the Friars. He's big, confident, energetic and passionate about getting better. Those traits have transformed him into one of college hockey's most respected goalies in a short period of time. "I guess there's nothing that surprises me about him, having been around him for a year and half now," Providence coach Nate Leaman told NHL.com. "He's big, athletic and very studious. He's learning every day what it takes to compete at this level, and the harder he works the more he competes. He has the potential to be an exceptional goalie on any level." 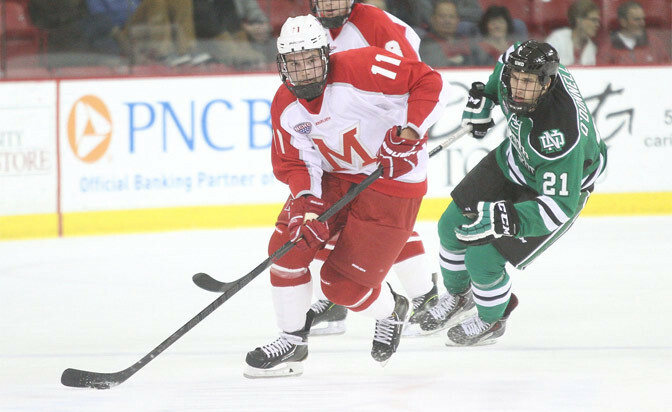 The sophomore, majoring in management, was selected by the Calgary Flames in the third round (No. 75) of the 2012 NHL Draft. As a freshman last season he was named Hockey East Rookie of the Year and was the school's first All-American since 2004. He had a 17-11-6 record, a Providence single-season record five shutouts, a 2.08 goals-against average and .931 save percentage. The 961 saves he made in 2012-13 rank fifth-most on the all-time Providence single-season list. "We had 13 freshmen on the team and 10 that were in the lineup last year," Gillies said. "We blew some late leads and had some bad moments, but this year we've been rock-solid and have been closing out games very well. We've been showing maturity and playing well in pressure situations." The fact Gillies gives his team a legitimate chance to win every game it plays might be the biggest reason Providence possesses that extra confidence against any opponent. Before departing for the United States National Junior Team selection camp last week, Gillies was 10-1-3 with three shutouts, a 1.88 GAA and .941 save percentage in 16 games (15 starts). "He was part of that young group last year and it probably put more pressure on Jon at times … it would put pressure on any goaltender because you know half your lineup consists of first-year players," Leaman said. "But entering the second half of the season I thought he really got better and we were playing better hockey. But all of our freshmen had to go through that transition stage." Gillies joined the Friars following two productive seasons with the Indiana Ice of the United State Hockey League. He holds Indiana records for most career wins (46), games played (78), shutouts (six) and highest save percentage in a season (.915 in 2011-12). He also scored a goal. The next big accomplishment likely will come when he is named the starting goalie for the U.S. at the 2014 IIHF World Junior Championship, which runs Dec. 26 to Jan. 5, 2014, in Malmo, Sweden. It's a role he will relish. "We want to win gold and represent our country the best way we can," Gillies said. "We expect to go out and play hard every night, play as hard as we can with everything we have." Gillies said he learned plenty as the backup during the Americans' gold medal-winning run at the 2013 WJC in Ufa, Russia. "It was phenomenal watching [starter John Gibson] play; he was by far the best goalie of that age group last year and he showed why," Gillies said. Gibson was named the best goalie of the tournament after going 5-2 with a 1.36 GAA and .955 save percentage. Gillies played one period in the tournament, stopping all seven shots he faced in the third period of an 8-0 victory against Germany in the tournament opener. "It starts with the way he conducts himself off the ice," Gillies said of Gibson. "He's always at an even keel, never gets too high or too low. There's no panic in his demeanor at all. On the ice he's an extremely hard worker, battles every shot and doesn't care if it looks pretty or not. "Those are the things I started to bring into my game." Gillies recalled how he lost the desperation in his game in the early stages of his freshman season at Providence before spending more than a month watching Gibson work his magic at the WJC. Gillies said it changed the way he thought between the pipes. "Seeing a superstar like [Gibson] do it night-in and night-out, where pure athleticism took over, was a nice thing for me to see and it helped me to understand what I needed to do," he said. Now Gillies wants to be the man to take the United States to a second straight WJC gold. "Everyone saw how important goaltending is in a big spot in this tournament last year," Gillies said. "Even when Jack Campbell came in during the 2010 World Juniors [in Saskatchewan] to help us win gold it was the same thing. The difference between winning and losing in this tournament is having a goalie who can make that one extra save when you most need it; that's what [Gibson] did last year and that's what I want to do now." Leaman believes Gillies provides that for U.S. coach Don Lucia. "I know what he can do on a grand stage like that and I'm excited for him," Leaman said. "We know he's going to play terrific and represent our program and the United States very well. I think it's a great chance for him to improve. Before he left [for camp] I told him this was a great opportunity for him to improve as a player, get better in a short tournament where there's a lot of high-pressure hockey. He'll be up against the best players of his age group in the world so I'm excited for him to improve."